Cathy began learning the piano as a child and has pursued her passion for the flute for the last 39 years! Over this time she has played in many community concert bands and orchestras, including the Hornsby Concert Band, Lane Cove Concert Band, Blue Mountains and Berowra Musical Societies, Strathfield Symphony Orchestra and most recently the Hills Shire Symphony Orchestra and Western Sydney Symphony Orchestra. Following a period as a full-time flute and piccolo player in the Royal Australian Air Force Band, Cathy established a private music teaching studio at her home in Castle Hill, in the north-western suburbs of Sydney, combining this with teaching in local schools. 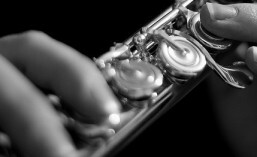 In the past Cathy has also run classes for adult beginner flute students in evening colleges. Cathy is a very experienced music teacher, having been teaching for over 28 years. Cathy is also a regular Adjudicator for the woodwind sections at the City of Penrith Eisteddfod. For eleven years Cathy was a flute and piccolo player in the Royal Australian Navy Band, and has performed with the Band at international military tattoos in Brunei, the United Arab Emirates and China – and in 2012 at the prestigious Royal Edinburgh Military Tattoo in Scotland. Cathy has also travelled to Hawaii with the Band, and in 2013 was honoured to perform at Gallipoli and Ankara in Turkey as part of the ANZAC Day commemorations. Cathy is also a keen chamber music player and has been a member of the New South Wales Chamber Music Society for many years. Cathy does voluntary work for the Society assisting in managing its extensive music library and has organised concert series for the Society at Sydney’s historic Independent Theatre and the Goethe-Institut. Cathy enjoys offering elegant and tasteful music programs for weddings, ceremonies and other functions. In the past Cathy has also been Secretary of both the Australian and the New South Wales Flute Societies. Cathy holds the Fellowship Diploma of Trinity College, London, and an AMEB Associate Diploma in Flute Performance, as well as a Master of Music Degree specialising in Instrumental Pedagogy from the University of New South Wales. Cathy is accredited as a teacher of Flute, Theory and Musicianship by the Music Teachers’ Association of New South Wales Cathy regularly undertakes further professional development activities, most recently completing a Graduate Certificate in Music Technology and a two day flute maintenance and repair workshop. Cathy was selected to participate in the World Adult Wind Orchestra Project as part of the Mid EUROPE International Wind Music Festival in Schladming, Austria in July 2018. Along with players from the USA, Switzerland, Kuwait, Germany, Malaysia, Austria and Japan, Cathy had the opportunity to further her skill and experience, rehearsing and performing advanced level wind orchestra repertoire with well-known conductors and composers, including Frank Ticheli, Phillip Riggs, Miguel Etchegoncelay, Johann Mosenbichler and Verena Mosenbichler-Bryant. Cathy enjoys playing and teaching all styles of music and caters for students who want to play the flute as a hobby, as well as those who wish to prepare for AMEB, Trinity College, ANZCA and HSC exams. Cathy is also experienced as a Duke of Edinburgh International Award Assessor for music. Cathy encourages all students to develop performance skills in concerts and eisteddfods. Cathy’s philosophy is that learning music must be an enjoyable experience resulting in a sense of achievement for students, parents and teacher.